We breed for Type, quality, health and disposition in our Devons.When you buy from us you’ve come to the right place. 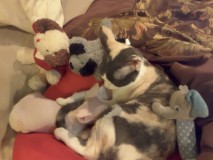 At Tex-Lonestar Devon Rex Cattery we give our kittens the attention and personal service that they need and enjoy. Our success comes from offering the you the best. We are a small family cattery that is located in Sheridan Texas. Where we are hand raising your next family member.